Comprehensive abdominal sculpting video which reveals the secrets to creating a lean, toned midsection. It’s for men and women of all fitness levels and it’s the exact program John used to chisel the ripped abs he displays in magazine layouts and TV commercials. 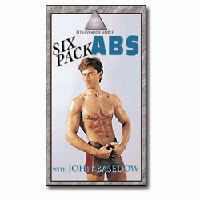 SIX PACK ABS offers 3 different home Ab Workouts to stimulate muscle development, 10 fat fighting Nutritional Tips to reduce fat deposits so you can actually see muscle definition, and a few of John’s Supplement Secrets to help enhance and speed results.